Now I Know My ABC's. . .
Just wanted to show you a little project I made for Monkey. 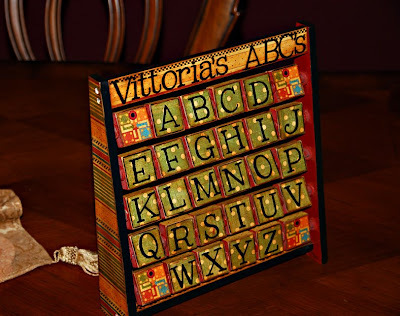 I found this cheap ($5) little wooden ABC game at Ross last week. I have been wanting to do some sort of personalized ABC game or book for Monkey for quite sometime. I wanted to use all kinds of fun pictures of her and her stuff to help her learn her ABC's. I decided this would be PERFECT!!! I made up a list of words or people that would mean something to Monkey for each letter of the alphabet. That was the hardest part of the whole process! I sanded the little game down really good and then used some acrylic paints from my stash that match the papers I was going to use. (okay, painting teh little rungs that hold the blocks was pretty hard too!) I also added little dots on the yellow to mimic the paper - not hard but time consuming. It took less than 2 sheets of Graphic 45 paper from my stash to cover everything I wanted covered. Then I just went through all of the photos I have taken of her to find ones to go with the list I made up. I resized them and was able to print all of them on three 4x6 photos. After a little distressing, inking and varnish we had a brand new game that is all hers! And it was so inexpensive and FUN to make! (under $8) Keep your eyes out when you are shopping for little treasures like this to play with and display your photos. 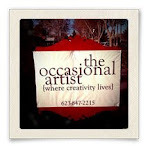 Handmade, personal, photo items make great gifts. and you would be surprised at how inexpensively you can put things together. I hope you all had a great week. I personally faught a headache for most of it. See some of you in class tomorrow!